Amazing Journey ~ Ainsley is 7 month old! This is an exciting month with few things happening. Looking back her old photos, she has grow so much, appearance looks different, skin is fairer, more responsive and in the mid of exploration. Teeth- she got 6 teeth now. So I got to be very cautious during breastfeeding, sometimes she bites! Yes, I’m still breastfeeding her. My pumping at work still continues, however it’s difficult to stick with the timetable, and sadly the yield is dropping. I couldn’t really identify which are my milk booster. But I do know that sleep deprived and stress is confirmed killer. She likes putting anything she can grab into her mouth, which includes her toes, socks, blanket, pillow, etc.. but not her teether, she just can’t hold and enjoy her teether as I wish she could. Hmmm, her favourites, still the remote control. She prefer black, maybe. Cuz the white air-con remote control doesn’t attract her that much. Feeding- she started with solid food since 6mo, quite ok. Most of the time is puree. I get her the food feeder, she can chew on the fruits, normally I give her apple, I gave her honey melon the other day, realize she don’t enjoy the cold fruits, her expression is priceless. Hehe…Obviously, she recognize her food bowl, that was one day I was preparing for her meal. Instead of serving her, I went back to the kitchen with the bowl (suppose to transfer to another bowl actually), she cried. I thought it was because I walk away. WH doesn’t agree. So we put the bowl on the dining table, and I walk to the kitchen without the bowl, that time she didn’t cry. Ok, I know, she just wants her food. First fall – it happens during midnight, after dream feed, I forgot to put her back to the centre of the bed. Next, I heard she cries and found her on the floor. Poor baby, she falls down from the bed for the very first time. I was guilty, I should have more alert and take care of hers. Sorry baby, mummy should have be more careful. Lucky she wasn’t hurt, probably was shocked. I quickly carry her and she manage to go back to sleep. I told my friends about this, and they said, “You will get used to it.” Now, have to be cautious even during sleeping time, cuz she will turn her body in all directions. Can’t have good night sleep. Apart from that, she has learn to stand by holding. She crawl and sit down by herself, she will wants your both hand so that she can support herself up. Still not quite steady, so we got to watch out every now and then. First flight – brought her along for our visit in KL. She has not met my other family member except my mum & sis. Family gathering after so long. The time round we book Airasia, free seat for infant (basically they don’t take up seat) but we got to pay for the tax. It’s about an hour flight, so I think it’s a good test to see how she adapt to new environment. We got more luggage to pack since she’s travelling with us this time. Good thing is she falls asleep before the flight set off. So we have no issue, until she woke during middle of the flight, probably due to hunger. I’m breastfeed her again and she back to dreamland. Next thing when she woke up, we already in my aunt’s car. She has no issue sleeping in new place, just she don’t enjoy the shower time. Cuz there wasn’t a bathtub for her to sit, she don’t like the shower. Bring her to my brother’s place, she wasn’t afraid of any of them and willing to be carried by others. My bro loves to carry her, he say girl really different from boy, he has 3 boys. However she was scared of her little cousin which use hand to grab her. Haha, I wonder why. Normally she’s the one grabbing other people stuff. My friend brought her daughter over, about 1 months older than her, she also grab the baby’s soother. The back journey also quite smooth, she again sleep before departure. But this time round she don’t want to sleep back after woke up and started making noise even after milk. Best still, she poopoo. The flight was earlier but couldn’t land due to traffic. So just get her to change after we touch down. Amazing Journey ~ Ainsley is 6 months old! It has been awhile since my last update. Marking the 6 month old for my baby Ainsley, she having 2 teeth now. Can crawl a bit and sit with support. She has been fully breastfed for the past 6 months. Wow, indeed not something easy, especially with her new tooth. I stick to the plan for starting her with solid food when she turn 6 months old. Before doing so, we got to get some equipment prepare. We have the weaning set from tomme tippee with bibs, now lack of is the high chair and the food processor. There are so many different kinds of high chairs in the market, from low end to high end. Price and functionalities varies. After much consideration, we decided to get something simple and commonly use, which is the IKEA high chair. Cheap yet it serves the purpose well, you can find them being use in restaurant as well. We bought the additional cushion, so that she can sit with support and more comfortable. 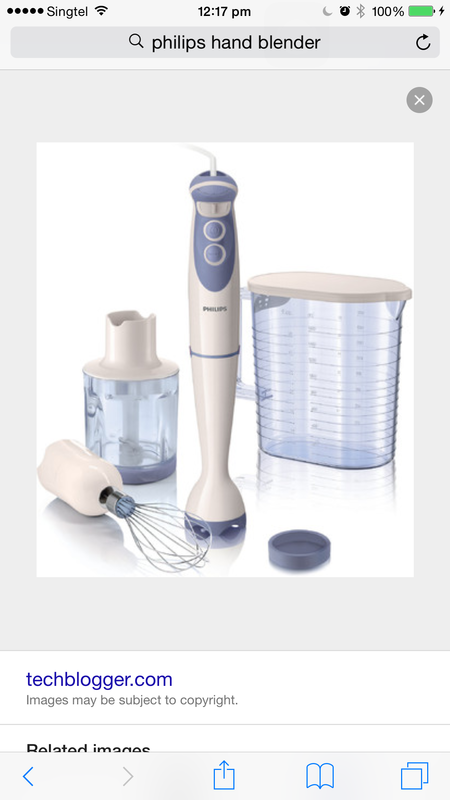 Apart from that, I also bought the handheld blender to blend/mash her food. Got it from Courts, Philips brand. pretty good stuff, it comes with the blender, whisk and grind. I can use it for my cooking as well. Other than that, I also purchased the food feeder and additional bowl for her feeding. As for food, I actually prefer her to start with fruits/vegetable puree first. However, the Avocado I wanted to buy is not available in the supermarket when I need them. And when I manage to got it, it’s not ripe yet and have to wait for few days before it ripen. I’m quite exciting over able to make different food for her. But sometimes it depends on what I can get from the supermarket, and I couldn’t prepare freshly for her, since I’m working. So normally, I would prepare 3 days portion, so that mil just need to reheat to feed her. Baby Ainsley quite ok with the food so far, except she was having constipation with some fruits. Have let her drink water, but she didn’t quite like it. Drink quite little but we always let her drink a few times.